We are listening, and we are noticing, and all of what we hear and notice helps us to better help you. This journey that we are on is one that we are all on together, and we don’t always know how something that we present to you is going to be receive until you receive it. We want you to know that we are always paying attention to what works and what doesn’t work for all of you. 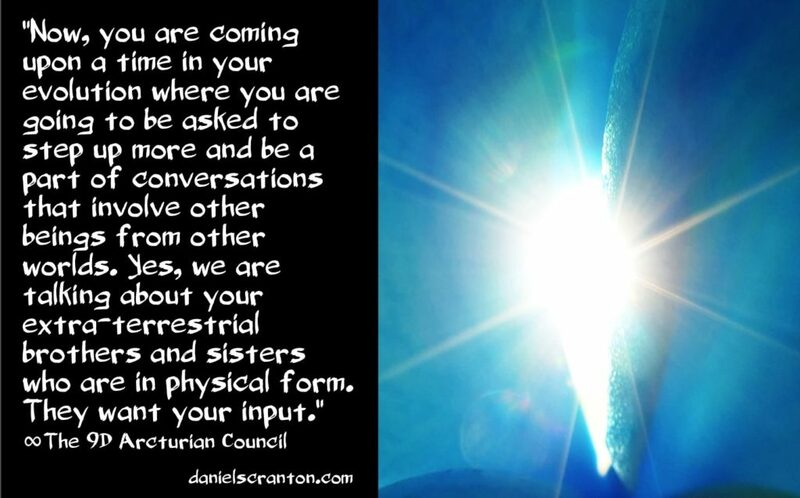 Now, you are coming upon a time in your evolution where you are going to be asked to step up more and be a part of conversations that involve other beings from other worlds. Yes, we are talking about your extra-terrestrial brothers and sisters who are in physical form. They want your input. And even though many of you who will receive this transmission are helping during your astral travels at night, it is a whole different experience when you are awake and sitting at a table with e.t.s that look very different from you. You are preparing yourselves for these interactions with the astral travel that you do at night while you are asleep, and they are preparing themselves for you. You are known as the emotional ones in the galaxy, and those emotions that you feel will be a welcome component to the conversations that will take place in the physical with these councils, collectives, and federations. We know that humanity is going to step up and provide great value to the discourse on how to move forward as a galactic community in peace and harmony, and we are doing our best to prepare you for these conversations. We look forward to witnessing them.